When it comes to installing fencing on your horse property, good planning is a must. The last thing that you want to do is to have your fencing installed and then think of changes you should have made. Here are some tips to get you started in creating a beautiful, safe fenced equestrian property. Before you decide on a type of fencing, consider where it will be going on your property and the aesthetic effect that it will have. Will the fencing be lining the entrance way to your property? If the fencing is the first thing that visitors see, you will want it to have a clean, impressive visual effect. You can achieve an appealing appearance with many different types of fencing, but the visual appearance you desire is something that you should settle on early on in the process of planning your fencing layout. Decide whether you want all of the fencing on your property to be of the same type. Also think about how close the fencing will come to the road, and whether you want to use a more solid fencing on those areas and a lesser barrier (electric fencing, for instance) on the dividing lines between the insides of pastures. The safety of your fencing should be top priority. Fencing needs to be easily visible to horses, so keep that factor in mind when evaluating the fencing’s appearance. Also think about how the fencing would withstand impact from horses – would it splinter and risk your horse being injured or escaping? 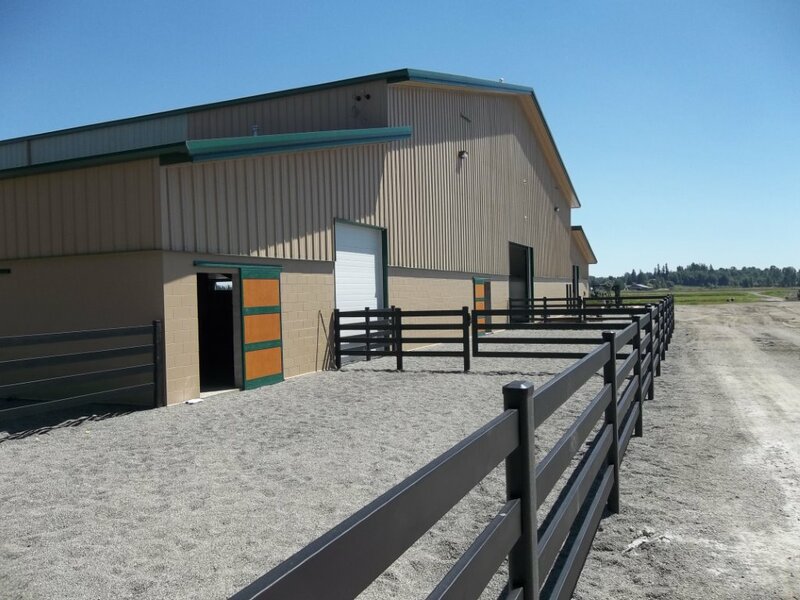 Buckley Fence LLC’s Steel Board Fencing is built to cushion the horse on impact before springing back into its original shape, keeping your equine partner safe and protected. Before you begin your fencing installation, give careful thought to the placement of gates throughout the property. In pastures with multiple horses, gates are areas where crowding can occur. Try to locate gates along open fencing lines, not in the corners of pastures, to avoid crowding and potential injury. Also realize that areas with gates will undergo heavy traffic; locate gates in areas where the land is of a high elevation (in relation to the rest of the field) to help avoid creating rutted, muddy entrance ways. Also think about whether you want the entire property fenced in. Having an entirely enclosed property is a huge safety asset in the case of an escapee horse. If you plan to install a perimeter fence, think about where would be best to locate a gate along your driveway. An automatic gate might be your best option, as it would allow for vehicle traffic but would keep your horses contained. Plan ahead before performing a fencing installation on your property to ensure that the finished product is exactly what you want.